Light rail carries far more people with a mere two car train than either a streetcar or an extended 70' bus. Even a single car LRV can often carry a dozen or more people than a single 70' bus. This mere fact alone creates an efficient solution between needing buses for a corridor, bumping up the throughput, and the next step which would be the major leap to high capacity commuter rail or a subway type system. Over the long term, light rail is easily cheaper than buses to carry passengers in any major transportation corridor. If the ridership on a bus line is peaking out at 10,000-15,000 per day, the move to light rail to handle greater than 15,000 per day. Yes, light rail, like a streetcar system is consistent and thus provides many of the same development bonuses. Transit oriented development built around the stops create a great living, working, shopping, and learning incentive for people to travel along those points without the need for a car or other less advantageous mode of transport. Light rail is easier to maintain at a high quality ride level than comparable modes like buses, BRT, or otherwise. This is especially true with buses that share roads with automobiles & trucking. Trucking does so much damage to roads that buses often equate to horrible ride quality within just a few years of operating in conjunction with trucks on major corridors. 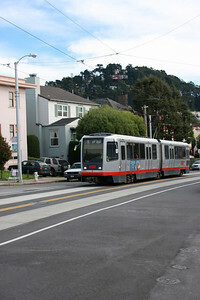 Light rail, simply does not have this issue since it is a dedicated right of way, and even in rare instance of shared right of way it sits upon tracks, not the always deteriorating roadway. The tracks do deteriorate, but at a much slower rate than roadways. Some of this could be remedied for buses by better road construction, but that isn't going to happen anytime soon, especially in the United States. Light rail simply costs a TON of money less than comparable bus service over the lifespan of the vehicles. Over a period of 20 years, light rail operations often will save enough money over comparable bus service to exceed that of the original capital costs of the system! With the way our inflationary fractional reserve system works it often recoups the original capital cost in savings in an even shorter period of time around 10-15 years. The money saved after this initial time span grows to exceed 50%. In Portland the original Blue Line cars & original Blue Line, already provide this level of savings somewhere around 2x cheaper than what comparable bus service would have cost. …and yes, to all those in disbelief, I’ll have the numbers up soon. I have a nifty spreadsheet I’ve been crunching numbers on and have been including a ton of data points. Ok, this is the reason I don't like because it is based on "feel" which generally isn't a good way to measure very many things. Light rail, compared to most modes of transport, is just COOL. Whatever other magic word you want to use could be applied; COOL, AWESOME, NIFTY, RAD, etc. When putting in something like this, that needs a ton of political support, it is vastly important to have the cool factor on your side, regardless of how patently absurd it is. 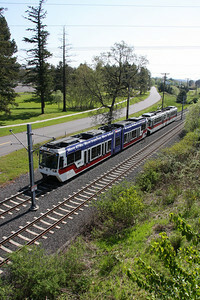 Light rail, just like streetcars, use electrical systems instead of diesel engines (most at least) which create a vehicle with less moving parts, and thus easier to maintain. Over the long term this creates a lower cost of maintenance. Again, as with streetcars, light rail vehicles last a very long time. Often far longer than most types of buses or even streetcars. This in turn, again equates to savings over the long term. More money for operations, additional vehicles, etc. As always, stay tuned, keep reading and I’ll have the final couple entries in this series of legitimate reasons for mode X up soon. The next in the series is passenger rail, and after that I will get to the oft misaligned work horse, the bus. There have been many studies to prove also that light rail and streetcars spur more business development along the corridor due to the fact that rail lines are a permanent fixture and businesses can count on long term customer traffic whereas bus lines can change at any time. Check sites like VTPI or Chris Smith’s transit blog for more info on this. "Yes, light rail, like a streetcar system is consistent and thus provides many of the same development bonuses." is questionable: Does the development occur because of the rail system itself, or because of the associated tax breaks that are often given to potential developers? In the Portland metro area there are huge breaks available if you build new a MAX station (but not a bus stop, which is patently unfair). Similarly, there is a long history of rail lines that have fallen into decay or simply removed altogether. Rail is not "permanent" but "fixed", meaning it can’t be picked up and moved like a bus route. That is legitimately a benefit, especially for developers who count on access to transit. But like like the Red Electric and Oregon Electric and all of the streetcar and interurban lines that were abandoned over the years, nothing is forever. Even roads aren’t forever, does anyone still remember the Harbor Drive freeway or the old freeway which went from the Steel Bridge north to Overlook? Assuming that one LRV (about $4 million each) can carry the equivalent of three 40′ buses (about $400k) each, the three buses cost $1.2 million and have a lifespan of 15 years versus 30 years for the LRV. So you’re spending $2.4 million for the equivalent buses, versus $4 million for the LRV. When you include operating costs, it takes a careful consideration of fuel/energy prices. In the Pacific Northwest, this benefit clearly goes to electric operations but even that is not always true. Seattle, for example, has a municipal power company and generates its own power from hydro (nearly 90% of its power). Trolleybuses are dirt cheap to run up there. Portland, on the other hand, has two private power companies and the majority of power comes not from hydro but from coal and gas – and the electric rates are about double that of Seattle. However…the Pacific Northwest tends to have higher petroleum prices due to the lack of local supply and refining capabilities. 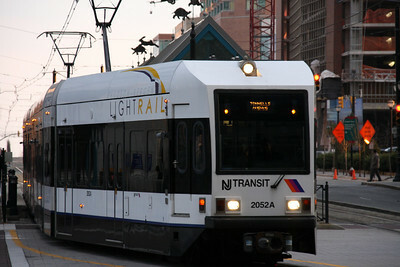 A light rail vehicle costs about $250-300 an hour to operate; a bus about $100. The difference really is in how many people board that vehicle. If you can fill that bus but not the light rail vehicle, the bus is cheaper. If you can fill the light rail vehicle, it will be cheaper. In the Gateway-Beaverton corridor on the Blue line, the trains are generally packed hour after hour and it makes sense. On the other reaches of the blue line, plus the Red and Yellow lines unfortunately it’s not true. The Yellow Line has plenty of ridership if there’s a major event at the Expo Center which is few and far between. On the other hand, the 12-Barbur bus outside of rush hour (when the 94s aren’t running) are typically packed in from downtown out to Barbur TC (but hardly south of Tigard). So the assumption that light rail is always cheaper is not true; it can be but so can the opposite. The challenge is to get past the stereotype and really look at ridership demands. If the line can pack a bus but not light rail, then make sure you have the best damn bus service there is for those riders. If you’re constantly turning away bus riders, then it’s time to increase capacity – whether it be more buses, bigger buses, or potentially upgrade to a streetcar/light rail line. So in the situation with the #72 line, it would make a TON of sense to get those people onto light rail, which would be even cheaper than articulated buses. Light rail also gives the possibility of upping the ridership well over what articulateds could handle. A light rail vehicle, as you point out, costs about $250 an hour, maybe $275, a bus $100. Which means just from the human resources perspective the light rail is a LOT cheaper over the long haul. 10 hrs of operation puts the savings somewhere around $500 bucks a day, throw that into 365 days ya get $182,500 bucks a year. That is for ONE light rail vehicle. Even modestly a single light rail vehicle will saving approximately $90k per year over operating 3 buses for the same service. So even by that math, running light rail where ridership dictates saves a TON of money for other services – for instance, buses on non-arterial routes. In the end, I really do agree with one thing you said, which I feel we’re in sync on, "The challenge is to get past the stereotype and really look at ridership demands. If the line can pack a bus but not light rail, then make sure you have the best damn bus service there is for those riders." TriMet absolutely needs to get in line with current demands, current development demands of where people are locating, and build accordingly.